With football you need to focus on the studs. The actual studs on the bottom of the shoe are long. This is because the cleat is meant to dig into the field to give your child more traction. This allows them to make cuts and turns easier. The leather of a football cleat is heavier and thicker than other cleats. This will protect your kids feet when getting stepped on, which if your child is playing on a offensive or defensive line this is something, us moms can be thankful for. There are three different heights to choose from, high top, mid cut, and low cut. High cut are for less mobile positions like the linemen. Mid cut cleats are for specialized positions like linebackers, running backs, and quarterbacks, that are mobile but still need protection on the ankle. Low cut are designed for speed positions, corners, safeties and wide receivers. Baseball and Softball cleats have a toe cleat in the front that digs into the dirt and helps with quick acceleration like stealing a base. These shoes are not made for contact, they are made for speed. Like a football cleat there are three styles low, medium, and high. You choose the cleat for your child based on what they need for ankle stability. There are also three kinds of cleats; metal, plastic, and turf. Metal cleats can dig into hard dirt infields and grass, but because of this they are also prone to injuries. You don’t need to start looking into metal cleats until your child is in high school. Plastic has the advantage when playing in muddy conditions because the cleat does not dig into the ground like metal. Some baseball fields are going to turf, this is when you would need a turf shoe. They can also be worn for training that is not on a baseball field. Your child should never wear plastic spikes on turf because they will not be able to grip the surface. Tennis shoes can sometimes be substituted for a turf shoe. Field hockey cleats are designed to be aerodynamic, but the choice of them depends on the playing field your child will be on -- grass, turf, or rubber. Kids should wear cleats with longer rubber studs on then when playing on a grass field. Turf shoes, like in baseball, have smaller rubber studs on the bottom of them. Field hockey is often played on a water based field where the turf is watered beforehand to keep the ball moving on the field of play. Having turf shoes will help players keep traction on the field. On a rubber field, kids can wear normal tennis shoes. If you are a runner, you don’t wear cleats but spikes. The kind of spikes you will need depends on whether or not your kids are sprinters, distance runners or compete in other field events. Sprinting spikes have little to no heel --- this design is to keep the runner on their toes. The spike plate has the maximum number of pins to provide as much traction as possible. For distance runners who use their whole foot, the spike has a bigger heel that almost makes it look like a training shoe. This helps accommodate the more flat footed landing of a distance runner. Field events vary based on the event and the surface it is performed on. Spikes should last your child two or three track seasons. Golf has two types of shoes, a golf spike and a golf cleat. Your child's choice should be based on three things, traction, comfort, and durability. You should help them decide what is most important to them. In Golf there are metal spikes, rubber spikes, and ceramic. Metal and Rubber spikes have a similar usage like they do in football and baseball. Ceramic spikes, though the most expensive, have the most advantages. They are long lasting and do not need to be replaced as often.. If comfort is your main objective, chose cleats over spikes. In Lacrosse, cleats are positioned on the outside edge of the sole for stability and side to side movement. Lacrosse cleats, like baseball, have a toe cleat on them…. There is usually a mid level cut for these cleats to offer ankle support but it still offers your child the mobility they need. In soccer, the cleat is made for agility and running so the studs are shorter and light weight. Metal cleats are better for wet surfaces to help the player keep their footing but they can only be worn in the later years of select soccer and in high school games. Soccer cleats are usually low cut but several brands have started to make hightops. 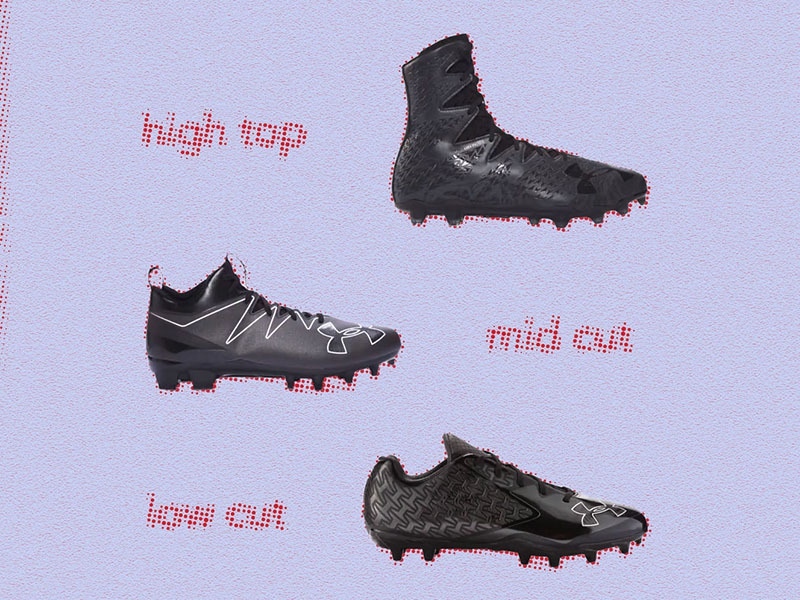 These cleats are the most versatile of all the cleats because they can also be worn for football, field hockey, baseball, and lacrosse if in a pinch. Your child should wear a regular cleat if playing on a long turf field. If the turf is short or you are playing indoors, your child will need a turf or tennis shoe.